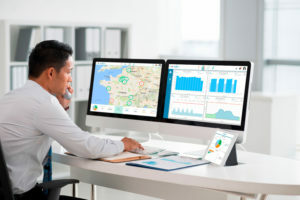 Whether you are a real estate builder, property owner or manager, you will undoubtedly have face same challenge: how to monitor your buildings’ energy consumption. Tracking energy performance is not only becoming increasingly important to reduce an ever expending energy bill, but a legal request. Energisme, a startup rated in April 2016 by Early Metrics, aims to solve your problems thanks to a combination of hardware and software. The company is already generating revenues, indicating a strong market appetite from industrial players for its services. Energisme collects data (electricity, water, gaz, environment,…) thanks to multi-fluid sensors, which are directly installed on clients’ sites. The sensors send the collected data to Energisme in real time. Through the startup’s online platform, clients can follow their buildings’ energy consumption, visualise their expenses, program consumption notifications alerts, and even use modelling algorithms to analyse energy metrics. The goal is simple: making sense of the data to ultimately decrease the energy bill. Initially launched in 2004 by Christian, Energisme has since matured: in 2014, Thierry (current CEO), Pierre (Business Director), and Haï (CTO) infused a new dynamic upon joining the company. Whereas Christian, with several years at Edelia (EDF), is an energy expert, the new partners have brought a new business and strategic vision which has allowed the solution to get monetized. Moving from being a pure hardware installer, Energisme now focuses on software and ambitions to become the reference in energy consumption collection and analysis. The team has signed several contracts with recognised industry and real estate corporate players, but it will need to focus on WCR considerations. Another challenge comes from the nature of the market and the competition which is dense. Despite this, given that the energy monitoring market is constantly growing, there are many opportunities for Energisme to keep growing. As Energisme is about to increase its sales efforts and secure new contracts, the Early Metrics team wishes its team the best success in the future!